Less than six weeks before launch, astronaut Timothy Kopra, injured in a bicycle accident Saturday, was removed from the crew of the shuttle Discovery Wednesday and replaced by astronaut Stephen Bowen, a veteran spacewalker who flew aboard the shuttle Atlantis last May. Despite the last-minute crew change, NASA officials say Bowen should be able to complete a hurried round of refresher training in time for blastoff around Feb. 24 as planned. The shuttle program today formally set February 24 as the target launch date for Discovery on her final voyage into orbit carrying a storage module to the International Space Station. Liftoff time is set for 4:50 p.m. EST. The subsequent launch of shuttle Endeavour carrying the Alpha Magnetic Spectrometer physics experiment to the space station will aim for an April 19 launch. 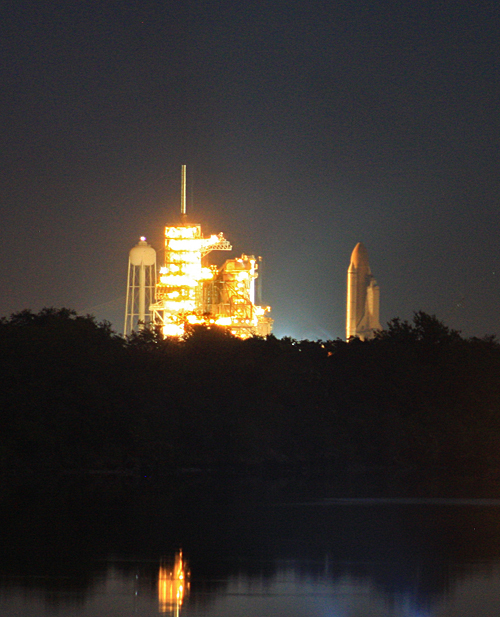 The sunset liftoff is set for 7:48 p.m. EDT. Engineers believe they have zeroed in on the root cause of cracks in the shuttle Discovery's external tank, NASA officials said Tuesday. Installation of a relatively simple modification to the tops of the structural ribs, or stringers, where the ship's liquid oxygen tank is supported by a massive flange should resolve the problem once and for all, setting the stage for another launch attempt Feb. 24. Senior NASA managers Monday agreed to install stiffeners all the way around the shuttle Discovery's external tank to beef up structural ribs, or stringers, that are susceptible to cracks when exposed to ultra-low-temperature propellant. Engineers say the modifications can be completed in time to support at launch as early as Feb. 24, assuming the work goes smoothly no other major problems develop. NASA managers Thursday decided to give engineers additional time to assess external tank cracks and repair scenarios, ruling out an early February launch for the shuttle Discovery. The next shuttle launch window opens Feb. 27, but NASA is assessing whether it might be possible to move that up a few days. Engineers examining the shuttle Discovery's external tank in the Vehicle Assembly Building have found four more small cracks in three structural ribs, or stringers, on the opposite side of the tank from the orbiter that could not be inspected at the launch pad. Four cracks on the shuttle side of the tank were repaired earlier, and it's not yet clear what, if any, additional work might be needed to develop the "flight rationale" needed for another launch attempt as early as Feb. 3. Inspections of space shuttle Discovery conducted this week have found cracks in three stringer support beams located on the external fuel tank's backside. The ship was returned to the Vehicle Assembly Building in order to conduct X-rays on this portion of the tank, which isn't accessible at the launch pad. Specially, the small cracks were uncovered at the tops of three beams on Panel 6 in the tank's ribbed midsection. The previously known cracks are on the tank's Panel 2 positioned on the frontside facing the orbiter. "The newly detected cracks currently are under evaluation and there has been no decisions on what affect, if any, these cracks will make on future plans," NASA said in a statement. Shuttle program officials are gathering for a planned meeting this afternoon to determine whether modifications are needed on the tank's midsection before Discovery can be launched. We'll have a full story later today. Structural inspections of shuttle Discovery's external tank will be finished today, leading into tomorrow's engineering meeting to decide if modifications should be implemented on the support beams. Analysis of the computed radiography scans of all 108 beams is underway to verify no additional cracks exist, particularly on the tank's backside that couldn't be examined at the launch pad. If managers determine that modifications are necessary to beef up the tank's ribbed midsection and prevent foam breaking away during launch, that work could begin next Monday. The digital X-ray scans of all 108 structural beams on the ribbed midsection of space shuttle Discovery's external fuel tank are underway in the Vehicle Assembly Building after the Christmas holiday break. It will take a few days to complete these surveys to look for any additional cracks and confirm repairs made to the original cracks held up well during the recent fueling test. The new foam insulation that was applied over the fueling test instrumentation was removed last week so technicians could detach the 89 special sensors that collected several terabytes of data during the Dec. 17 tanking. Those areas will be re-foamed before Discovery returns to the launch pad in a few weeks. The Kennedy Space Center workforce is taking today and tomorrow off for Christmas. Activities in the Vehicle Assembly Building will resume on Sunday. With Discovery parked inside the Vehicle Assembly Building, technicians have quickly gotten to work erecting special scaffolding and platforms around the space shuttle to gain access to the external tank's midsection. "The main reason to go back is to get X-rays on the backside of the tank, and there is a platform that goes there, but it's about maybe two feet wide and a very long drop all the down to the deck of the MLP. So we got to build some scaffolding and some personnel fall protection to get the teams up there to do the X-rays. It goes up about 25 feet from off the deck of that platform they'll be getting access. "Between Christmas and New Year's, our NDE, our non-destructive evaluation, team will be busy shooting X-rays, and then we'll move into the January timeframe to look at what we need to do, any future work on the tank." Leaving the launch pad and rolling back to the Vehicle Assembly Building overnight, the space shuttle Discovery will spend the holidays having the external tank digitally X-rayed as engineers look to prove the hypothesis that its structural cracks resulted from pent up stresses accumulated during construction and were unleashed during the strains of cryogenic fueling. ROLLBACK COMPLETE. Space shuttle Discovery safely arrived back inside the Vehicle Assembly Building following the overnight road trip from the launch pad. The rollback officially began with first motion at 10:48 p.m. and was called complete at 7:01 a.m. EST with the platform anchored to the VAB pedestals. Our second batch of Discovery rollback photos has been posted in the gallery. Jacking down is in progress. The crawler's hydraulics are ready to lower the platform down onto the pedestals. Discovery's launch platform is being lined up over the VAB's pedestals. The crawler is crossing the threshold into the cavernous VAB. 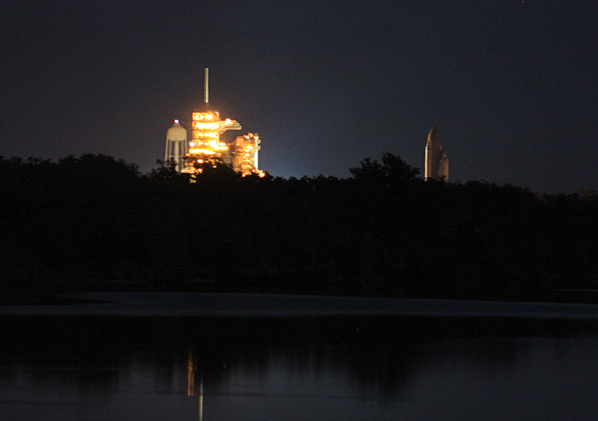 Seven hours into the rollback, shuttle Discovery is nearing the 52-story landmark Vehicle Assembly Building. Rollbacks have been relatively rare occurrences over the three-decade life of the space shuttle program. Today's move is the 20th since 1983. Technical problems prompted the majority, although several were due to the threat of tropical weather and hurricanes. This is the sixth rollback for Discovery in the 39 flights of the orbiter. See a complete list and reasons for past rollbacks. The two mission payloads remain safely packed inside Discovery's cargo bay during this detour back to the Vehicle Assembly Building. The Permanent Multipurpose Module and the Express Logistics Carrier No. 4 had been loaded into the shuttle on October 11. The Italian-made module that will give the International Space Station a float-in closet and help ease the outpost's storage woes. It's the retrofitted Leonardo reusable cargo module flown on roundtrips several times in the past. ELC 4 is a pallet-like deck to be hung outside the space station for storing external spare parts. A replacement thermal radiator is folded up accordion-style on the carrier for launch on Discovery. Some more pictures have been added to our rollback photo gallery. The crew has stopped the crawler to replace a possible clogged oil filter. About 30 people are aboard the transporter to operate it during the roll, including three drivers -- a prime and backup in the front cabin and one in the rear -- a jacking and leveling operator, a control room operator to run crawler systems and talk with the Launch Control Center, two electricians, two electronic technicians and four diesel mechanics for starting, monitoring and shutting down the transporter's engines. The other team members are mechanics watching over the roll and helping with the platform's docking to the pedestals. The sliding doors to high bay No. 1 of the Vehicle Assembly Building have been opened to receive Discovery in a couple of hours. Check out our first batch of Discovery rollback photos taken by Spaceflight Now's Justin Ray. The stone-covered pathway connecting the VAB to the launch pad is 130 feet wide -- almost as broad as an eight-lane highway. Two 40-foot-wide lanes are separated by a 50-foot-wide median strip. The average depth is seven feet. Now at the four-hour mark of the rollback. Hauling the shuttle stack from launch pad 39A on this 3.5-mile trek is one of NASA's two Apollo-era crawler-transporters. The combined weight of the transporter, mobile launch platform and shuttle Discovery is 17.5 million pounds. Another stop for the transporter to grease another warm bearing. The team estimates the shuttle is about half-way between the pad and VAB. The transporter consumes 126 gallons of diesel fuel in each mile it travels from the VAB to pad. The machine has a fuel capacity of 5,000 gallons. The crawler has stopped for a few minutes while techs apply some extra grease on one of the bearings. Discovery is passing by the Kennedy Space Center's Visitor Center observation gantry as the rollback proceeds smoothly. That's where the crawlerway forks into two pathways -- go left to pad 39B or straight ahead to pad 39A. The transporter is making good progress now two hours into the rollback. The crawler has made the curve to leave the launch pad 39A entrance. It's now a straight shot toward the Vehicle Assembly Building's high bay No. 1. Discovery had spent exactly three months on the launch pad, rolling out September 21 for the original liftoff date targeted for November 1. But the technical troubles have forced this rollback to the Vehicle Assembly Building to gain additional inspections of the external tank. The shuttle's return to the pad could happen by mid January, leading to blastoff in early February. Check out a couple of pictures showing Discovery leaving the pad. Credit: Spaceflight Now/Justin Ray. Discovery is exiting through the pad perimeter fence on the road back to the VAB. The obstruction has been pulled out of the way and rollback is underway again. The crawler has stopped to move some flexible air hoses that were rubbing between the platform and pad tower. ROLLBACK BEGINS. The crawler-transporter hauling the space shuttle Discovery has begun inching away from the launch pad 39A pedestals en route back to the Vehicle Assembly Building for inspections of the external fuel tank. The mobile launch platform has been jacked to clearance height for leaving the pad. The pad perimeter's gate is being opened to allow Discovery out. In our live video stream, now you can start to see the space between the pad pedestals and launch platform as the crawler literally picks up the space shuttle. The launch platform has begun to rise off the pedestals. The "go" has been given for the crawler to start raising up the shuttle stack to travel height, thereby hoisting the mobile platform above the pad pedestals. The last of the cables have been unplugged. Final jacking of the crawler is up next. It's 10 p.m. but there's still a bit of work left to accomplish before the rollback gets underway. No estimate on exactly when the roll will start. Observers are being deployed to their locations around the pad for monitoring the shuttle's departure. Power transfer to generators for tonight's journey is complete. The final ground umbilical cables are being unhooked from the platform now. The ground crew is conducting an engineering walkdown of the launch pad, looking to make sure everything is configured properly for rollback. Moving a key step closer to the rollback, the crawler has propelled itself into place below the shuttle. Now, the crawler's hydraulics will be jacked up to the preparatory waypoint just two inches under the mobile launch platform. The crawler is motion now, carefully driving back into position underneath the shuttle's mobile launch platform. Engineers have completed the removal and replacement of a faulty transducer in the crawler's leveling system that prompted this one-day delay in rolling back Discovery, NASA reports. Weather forecasters predict another night of fine conditions for moving the space shuttle. The overnight specifics include just a few high clouds around 27,000 feet, light and variable winds of just 3 knots and a temperature in the low 50s falling into the mid 40s F.
The call-to-stations for the rollback team is occurring right now at the Kennedy Space Center for this second attempt to get Discovery moved off the launch pad and back to the Vehicle Assembly Building. The trip remains targeted for about 10 p.m. EST. We have updated our launch windows chart with the latest times available for Discovery to fly in February and early March. NASA believes a faulty transducer in the crawler-transporter caused the erroneous height readings from the precision leveling system when the machine was traveling up the launch pad ramp last night. The team is replacing the suspect part and still plan to get the rollback underway tonight around 10 p.m. EST. The revised schedule now calls for the team to report on station later this evening at 7 p.m. with a planned rollback start at 10 p.m. EST. The shuttle should be inside the Vehicle Assembly Building before sunrise on Wednesday. The transporter has completely backed out onto the pad surface away from Discovery. Handrails on the transporter have been decked out for the holidays. Workers have put strings of festive lights on the crawler for the pre-Christmas rollback of Discovery. The crawler has started its removal from below the shuttle's mobile launch platform for further testing of the transporter's leveling system. NASA officially says rollback is delayed until at least Tuesday afternoon because of this crawler problem. To recap, Discovery's departure from the launch pad is on hold because of a problem with the crawler-transporter's leveling system. The team is devising the troubleshooting steps it would like to take and what repairs might be required to correct the issue before the shuttle's rollback to the Vehicle Assembly Building can be rescheduled. Engineers are putting together the game plan for working the crawler problem and a new timeline for rollback. Pulling the crawler out from underneath the shuttle and doing some additional testing of the jacking and leveling system is being discussed. Obviously, everyone wants to make sure the hardware is working properly before starting the rollback. The crawler team continues to assess the trouble first noted during the climb up the pad ramp when one of the corners was higher than the other three. Engineers are examining the height instrumentation in the transporter's precise leveling system that ensures the crawler will keep the shuttle stable during the trip back to the Vehicle Assembly Building. Power transfer to generators for rollback has been accomplished. The rollback countdown clock is passing T-minus 60 minutes. But the crawler team is looking at a potential instrumentation problem in the hydraulic jacking system. Measurements are being taking right now to see if there's an issue or not. Still left to finish in the rollback prep work is the transfer of power to generators and disconnection of the final umbilical cables. The launch pad's external tank access arm is swinging back now. This is the platform that enables workers to reach the intertank area and connect the gaseous hydrogen vent system on the external fuel tank. The crawler has raised within a couple of inches to the platform. Final jacking will be completed later. Approval has been given for the crawler-transporter to start hydraulically jacking up. The pistons will lift the mobile launch platform from the pad pedestals as rollback preps continue. NASA's Apollo-era crawler-transporter has been positioned under Discovery. The crawler is sliding underneath the mobile launching platform upon which Discovery sits. The transporter will be picking up and carrying the combined platform and shuttle back to the Vehicle Assembly Building overnight. There goes the orbiter access arm moving away from the crew hatch on the port side of Discovery. The arm is the passage way for ground technicians and the astronauts to board the shuttle's crew module. Crawler has progressed about three-quarters the way up the pad incline. The crawler-transporter is about to enter the pad perimeter. It typically takes the crawler about 45 minutes to ascend up the pad ramp and another 15 minutes to get underneath the shuttle platform. The perimeter entrance gate at pad 39A has been opened for the crawler-transporter to drive in. The crawler's team warmed up the massive machine a little bit ago. It'll take about an hour to get the transporter moved into the pad and positioned beneath Discovery once the approval is given. The gaseous hydrogen vent arm has been lowered down and away from the shuttle. It was detached from the umbilical fitting on the external tank a couple of hours ago. This 7-inch-diameter line funnels gaseous hydrogen out of the shuttle tank during fueling, across the umbilical arm to the pad tower, down to the ground and eventually out to the flare stack for burning. The formal four-hour final sequence of rollback activities has now begun. Things earlier tonight were running approximately an hour behind the original timeline. So this puts the rollback's start time around 1:55 a.m. EST and arrival back at the Vehicle Assembly Building at sunrise. Retraction of the launch pad 39A's rotating service structure is complete. NASA says it's looking more like 1:30 a.m. EST for the rollback to commence. The gantry is about half-way around to the park position. And now the giant mobile service gantry has begun its slow retraction away from Discovery. The cocoon-like structure encapsulates Discovery during its say on the launch pad. Discovery's hatch just swung shut. The doorway to enter the shuttle's crew module is being secured and locked in preparation for retracting the pad's orbiter access arm tonight. Inside the pad's white room, techs are preparing to close Discovery's crew module hatch and configure the orbiter access swing arm. All weather conditions are acceptable for transporting the space shuttle along the three-and-a-half-mile route from the launch pad to the Vehicle Assembly Building. The latest forecast for the overnight hours calls for a few clouds at 3,500 feet, a layer of broken clouds at 28,000 feet, good visibility, northerly winds of 8 to 12 knots and temperatures falling through the 40s F.
The gaseous hydrogen vent arm has been demated from the ground umbilical carrier plate. The GUCP will remain affixed to Discovery's external tank during the voyage back to the Vehicle Assembly Building. Retraction of the rotating service structure has been delayed a little while and won't be starting at 7:30 p.m. EST after all. Right now, technicians are working to disconnect the launch pad's gaseous hydrogen vent arm from the backside of shuttle Discovery's external fuel tank. The moon is rising as the sun sets at launch pad 39A. Engineering walkdowns of the tower and pad in advance of gantry retraction will get underway around 6 p.m. EST. The lunar eclipse will occur during the overnight rollback of Discovery, and the weather forecast for skywatching looks pretty good for Kennedy Space Center. Activities underway today include disconnecting the wiring running to the external tank special instrumentation and hydraulically positioning the main engine nozzles for rollback. Later this evening, the rotating service gantry will be pulled away from Discovery at 7:30 p.m. EST and the orbiter access arm retracted. The crawler-transporter, already pre-staged at the pad's perimeter gate, will be driven up the ramp and positioned beneath the mobile launch platform. The rollback crew remains scheduled for a call-to-stations at 8:30 p.m. and the shuttle's departure from the launch pad to start at 12:30 a.m. EST. We will provide live coverage of shuttle Discovery's rollback to the Vehicle Assembly Building throughout the overnight hours. Technicians working in protective suits today are draining the hydrazine fuel from the hydraulic power units on shuttle Discovery's solid rocket boosters. HPUs are used to gimbal the booster nozzles during flight for steering the shuttle. The de-servicing work and other rollback preparations are progressing under gloomy skies at launch pad 39A this weekend. The remaining hydrogen in the external tank boiled away from Saturday morning and the pad was reopened for work. 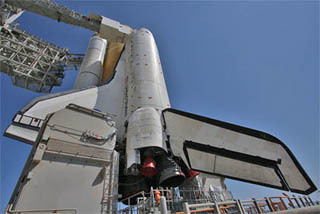 The shuttle's trip to the Vehicle Assembly Building remains scheduled for early Tuesday. The rollback team is scheduled to report for duty Monday night at 8:30 p.m. EST. First motion of Discovery is targeted for 12:30 a.m. EST and the mobile platform should be secured in the VAB by 7:30 a.m. EST.